Traumatic falls with an outstretched arm can sometimes do a lot of damage to a variety of structures. 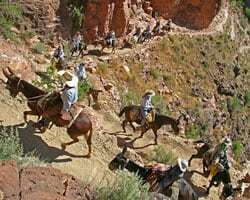 A patient was taking a guided tour on horseback through the Grand Canyon. Unexpectedly, he was thrown from the horse. 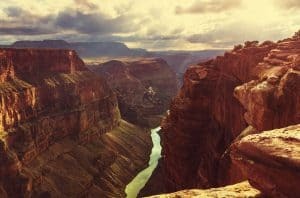 During his fall his right dominant arm was outstretched and injured. He immediately knew it was dislocated. It relocated back in place when he moved it. The pain was intense. In order for a shoulder to dislocate surrounding tissues to the shoulder joint the capsule, ligaments, glenoid labrum, and possible the rotator cuff may all be torn in the process. It is important not to overuse the arm during the acute period to prevent another shoulder dislocation. The glenoid labrum is the cartilage covering the top of the humerus where it forms the shoulder articulation. Overlying the glenoid labrum is the rotator cuff. The rotator cuff is a unique arrangement of 4 shoulder muscle tendons that form a covering for the shoulder joint. This unique structure adds stability and flexibility for the incredible motion arms can move especially in sports. The hip is similarly a ball and socket joint covered with cartilage, also known as the labrum. However, the hip doesn’t have the flexibility that the shoulder does as it is more of a boney joint composed of the femoral head and the acetabulum. It lacks the tendinous structure of the rotator cuff that gives the shoulder its greater movement and flexibility than the hip. Both the hip and shoulder may sustain damage or tears to the cartilaginous labrum. Shoulder labral tears often are given additional names based on the location of the tear in relation to the head of the humerus bone. Example SLAP tear refers to superior labral anterior and posterior. Labral tears have become increasingly operated on. Now that we have data dating over 20 years, we can see similar problems with labral surgery, as we did with knee arthroscopic meniscal surgery. Years later there is an associated increase in the earlier development of shoulder joint arthritis. This has long been known to be the case in Knee meniscal surgery and is much worse when the surgery occurs after the age of 50. 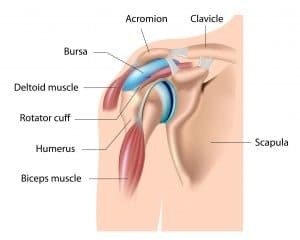 The rotator cuff is a tendinous structure surrounding the shoulder joint to provide stability, support, and aid in the great mobility that the shoulder has. The ability to perform in a great manner in various sports such as pitchers in baseball, or serving in Tennis, is due in a large part to the structure and integrity of the rotator cuff. Injury, chronic wear and tear, and shoulder dislocation can all affect the rotator cuff so that normal routines are no longer possible. Shoulder problems are becoming a frequently encountered joint for Regenerative Medicine procedures. 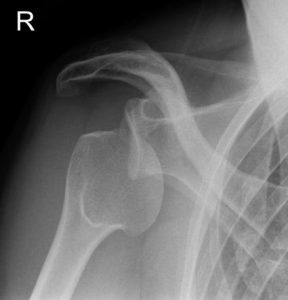 Depending on what the problem in the shoulder is, the severity, and what the patient’s goals help determine what is appropriate Regenerative Medicine treatment options. There is no one size fits all treatment. Nothing in Medicine works that way. Beware of promises that sound too good to be true. A claim of a vial of someone else’s stem cells to treat anything is an important clue something is wrong with that. Imagine going to a cardiologist and he claims whatever is wrong with your heart there is one treatment that fixes everything. It does not work that way. Treatment for the shoulder is tailored to each patient’s specific problems and needs. That is the practice of good medicine.